Our ship dropped out of the Gate inside of Mariovel space. Corvan battlefleets patrolled the system but acknowledged our IFF transponders and allowed us to continue into the starsystem. The red supergiant of the Mariovel system had two smaller companion stars which were only visible if you knew where to look. After programming the coordinates for the Mariovel homeworld, the WarpRunner jumped and we emerged in the shadow of the goliath of planets. A great banded world of luminous clouds of various shades of pink, gold, coral and brown. “Look into the upper hemisphere of the planet. There should be a Great White Spot. That is the space they have create for any visitor’s habitation during the planetary refitting. Everything is on schedule, they say the planet will be ready in less than a year.” Sitting in the pilot’s chair, I was trying to strike up a conversation with a cool and prickly Diplomat of the Hegemony. “I understand they produce only one planet a century here?” He was trying to be polite, but I could tell he really didn’t want to talk to me. “Your records indicate you live on Galatea II, Captain. What’s wrong with Galatea II? It has been the cradle for a majority of the Humani species now for almost a thousand years.” He sounded smug as if his reading my records gave him an advantage. Our class six WarpRunner was fitted for the Mariovel home-world and had the adjusted beacons needed to land in the protected regions. We would need a ship designed to interact with the powerful gravity technology of the planet. As we approached their home-world, we were struck by its sheer immensity. It defied anything we knew about planets. Three times the literal size of Jupiter, it was surrounded by a gaseous cloud layer similar to most gas giants but that was just part of the story. There were several cloud layers, all the way to the surface of the planet. They had a gravity technology directed from the planet that changed the gravitation constants, allowing visitors from other planets to come to their world and live comfortably during the process of planet crafting. The Great White Spot is their equivalent of a landing pad for visitors. Eighteen thousand miles in diameter, the Great White Spot moved slowly in comparison to other storms on the planet. The Mariovel were one of the races of the galaxy’s races that had never been conquered or even effectively attacked. Their world was inhospitable to almost any other form of life. The incredible storms that swept the surface with their two thousand mile an hour winds and their crushing atmospheric pressure were able to destroy all but the most durable alien ships. Add the super-gravity of its planetary surface, and most forms of life simply cannot negotiate it. There is also one other aspect which most invaders remember. With a gravity well as deep as theirs, unless the Mariovel allow it, no one who lands, leaves. We would not be going to the actual surface, though. We would be stopping at the third layer where buoyant fungi forms were floating through the atmosphere of the planet and were used as a base of operations inside the White Spot. With the surface area of two thousand Earths, this was little more than a tiny way station on their vast planetary surface. The Diplomat is wearing a Humani standard hardened bio-suit. It has been encrusted with his sigils of accomplishment and awards of state from almost three dozen worlds. The suit is designed to emit information into the infrared and ultraviolet spectra to allow the Mariovel to detect them and with a standard mediasphere connection, they will be able to interpret their meanings and other galactic standard information. My own suit is far less ornate, indicating only my rank, my modest accomplishments and my suitability for classified information management. I would be allowed to go everywhere the Diplomat went and able to witness any transactions. It is not necessary for a Diplomat to have a Humani witness for such transactions but it has been a tradition for millennia. As the bay doors open on the WarpRunner, we are immediately assaulted by the heated air and the strange smell of the planet. It has a strong ammonia smell, nothing dangerous, but certainly unpleasant. There are other odors as well, one that reminds me strongly of cinnamon, and the other of baking bread. There is quite a wind blowing as well, and it takes a moment to adjust to the force of it. Nothing our suits cannot handle. There is a white spongy material on the ground, and then I realize it’s the living fungus of that makes up the Spot. I could see buildings off in the distance, also made out of the same materials. There are dozens of different ships here from a variety of the galaxy’s races, each negotiating for their own planets or resource development of one sort or another. The sky is white with light from the overhead clouds and at the edges of the of the fungus, I could see lightning flashing as the two weather patterns met. I can see flying creatures in the distance, but remember reading they were actually like everything else on this planet, gigantic in size, only their great distance belied their size. Leaving the ship, we are met by a Mariovel in their foglet form. As near as I understand it, they are capable of three different states of being. One is an energy form they use to repair ships when they are part of a Corvan battle fleet. The other is a large and mostly rocky form suitable for almost any environment. In that shape, they are mildly radioactive so they don’t tend to use it in the presence of more organic beings. This cloud form is the only one that is not radioactively toxic to any of the Humani tribes. My suit indicates that we are in the presence of Chalguldan and I marvel at the beauty of this state of being. Zhe, using the polite non-sexual pronoun, appeared as a starlike collection of nano particles orbiting a larger central mass about the size of an apple. The cloud was about two meters in diameter and twinkled with both internal light and light reflected from the environment. When it spoke, it emitted light that was interpreted by my suit’s interface system and translated. I also spoke Galac Six naturally having been trained with biometric and computer languages nearly a hundred years before. I was certain the Diplomat did as well. And just like that, we were gone from the spaceport and suddenly what looked like the Earth hung in the sky above me. It was a beautiful as anything I ever remember seeing. There were blue oceans, polar ice glistening from the background light of the Great White area. The Diplomat tried not to appear even remotely affected by what we were seeing, but my mouth hung open for several minutes. 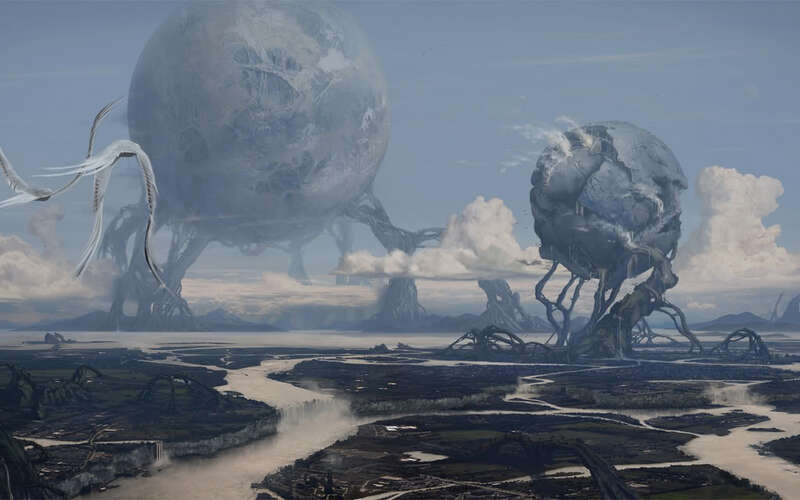 Sinian looked up at the planet and marveled at the organic looking structures linked to Earth Two. These great limbs-like structures appeared to hold the planet in place and as the structures reached the planet, they branched out again and again like capillaries surrounding the planet in a fine mesh. However in scale, those fine appearing cables were likely to be hundreds of miles wide. I found myself growing warm and uncomfortable as I watched the Mariovel’s movement pattern grow more complex as if it were assessing the words of the Diplomat. I also notices clouds of other Mariovel approaching our position, pulsing in unison with Chalguldan. Soon, dozens of Mariovel hovered over us and began exchanging elements from each of their clouds. Elements swarmed over us, around us, and soon we were in a sphere of moving foglet elements. As the elements began to swirl, they began to emit colorful light patterns. At first I thought it was a form of communication but I could find no useful patterns in it. Suddenly, Sinian and I were standing in a factory shoveling coal into a furnace. We were sickly and malnourished and every cough produced a black phlegm that seemed in endless supply. Smokestacks blackened the sky in every direction. Sinian collapsed and I carried him outside of the factory. We were taken to a local hospice area where he was pronounced with tuberculosis and only had a few days left to live. I stayed with him while he expired in agony. Night fell and we were suddenly wearing masks on our faces and there were deep walls on both sides of us. We carried primitive rifle weapons and were being sent onto a different battlefield in the dark. A cloud of smoke floated into our trench and my mask was not sealed properly. I began to choke and sputter and found my chest burning, searing with unimagined pain. Sinian tried to help me but I could not hear a word he was saying. Soon he is the only one left alive as the green cloud claims the lives of everyone around him. Then I found myself running chest deep in water, toward a beach, while exploding rounds rocked the ground in every direction. I was dragging Sinian. He had a wound on his chest and I was watching men dying all around me. It seemed to go on forever. We were forced to take cover behind large metallic X shaped objects as the shelling continued. We made our way up the beach but high caliber rounds ripped men to pieces, their anguished cries for their mothers, rang hollow in my ears, as I struggled not to join them. Sinian is struck in the head and I fall to the sand with the shock of his dead weight. I woke in a camp with a high fence wearing a striped uniform. Sinian was nowhere to be found. Everyone was sick and pale and nearly dead from starvation. The smell is terrible. It’s the smell of death. The death of thousands. I struggled to rise and stagger outside. The light is so bright. I can hear others whispering and cowering. I saw men carrying guns knocking down a fence and Sinian rushed to me and offered me water. I threw up the water because it had been so long since I had anything to eat. We found ourselves in the middle of a rain forest surrounded by crude oil pits carved into the earth, while a multinational corporation extracted it without concern for the indigenous people who lived in the area. Sinian was a corporate worker while I was a member of the locals who was dying from cancer. Sinian spent time with me when his duties allowed it, but he could not stop what the corporation was doing no matter how silvered his tongue. We were both shot while we discussed the horrors of the what was happening and how we were going to expose the corporation’s misdeeds. We watched as we slowly expired from starvation in what was called Africa as corporation’s priced seed out of our families ability to afford it. Our farm stopped producing food and our families starved, one child after another until no one in our village was left. Wars around our villages prevented people from trying to leave sooner. We staggered out, last men standing to try and walk to a neighboring town. We starved to death in transit. “Diplomat Sinian, are you sure?” I kneeled down next to him, the soft loam beneath me. Sinian and I stared longingly up at Earth, her deep blue oceans and swaths of green and gold beckoned to us. I helped Diplomat Sinian to his feet and he seemed relieved to have made a decision he could live with. “What are you going to tell the council?” The Mariovel retreated into the distance and I saw Chalguldan flash a brief goodbye in Galac 6 before our instantaneous transmission to the spaceport. First Appearance: The Mariovel first appear in my novel Insurrection as an advanced galactic race that has allied with the current leaders of the galactic empire, the Corvans. Because of their facility with nanotechnology and temporal mechanics, they are able to craft entire planets by controlling and compressing the flow of time around the worlds they create, creating planets in hundreds of years, rather than millions. They also possess the ability to alter their physical composition to take on a variety of forms and survive in a variety of conditions. About the Art: The painting is called “Genesis-1920×963.” I know nothing about the piece beyond that. When I performed a search, it shows up in numerous libraries with no one laying claim to it. If anyone can tell me who it belongs to, I would love to give credit where credit is due. The painting inspired me to write this particular story and I must acknowledge its awesomeness.